According to documents obtained by Earth Island Journal, investigators from the Bryan County Sherriff's Department had been spying on a Great Plains Tar Sands Resistance training campthat took place from March 18 to March 22 and which brought together local landowners, Indigenous communities, and environmental groups opposed to the pipeline. the upcoming protest, internal strategy, and the character of the protesters themselves. In an emailed statement, TransCanada spokesperson Shawn Howard did not directly address the Tar Sands Resistance training camp. Howard described law enforcement as being interested in what the company has done to prepare for activities designed to “slow approval or construction” of the pipeline project. “When we are asked to share what we have learned or are prepared for, we are there to share our experience – not direct law enforcement,” he wrote. 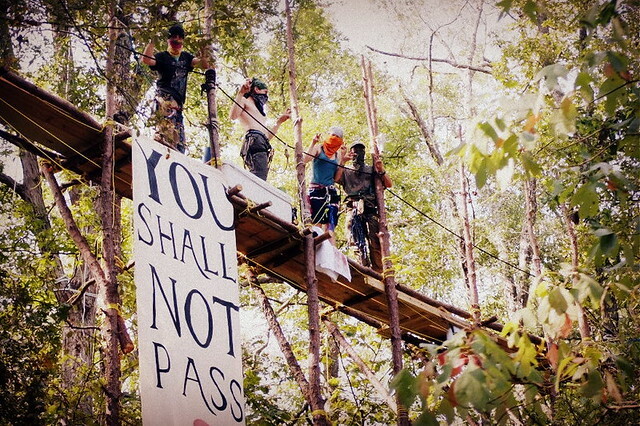 Cushing protest is part of a larger pattern of government surveillance of tar sands protesters.